The actress Geeta Basra celebrated her birthday with not just hubby Harbhajan,with entire Indian cricket team.It was ever best birthday of her.Now she turned 32 today 13 March 2016. Even Bhajji also planned a special surprise for his ladylove on her birthday.He arranged for a cake cutting ceremony in the Indian cricket team’s dressing room with the entire team. Mahendra Singh Dhoni, Shikhar Dhawan, Ravindra Jadeja, Ashish Nehra and Rohit Sharma and everyone was presented and sang the Happy Birthday song for their bhabi Geeta. 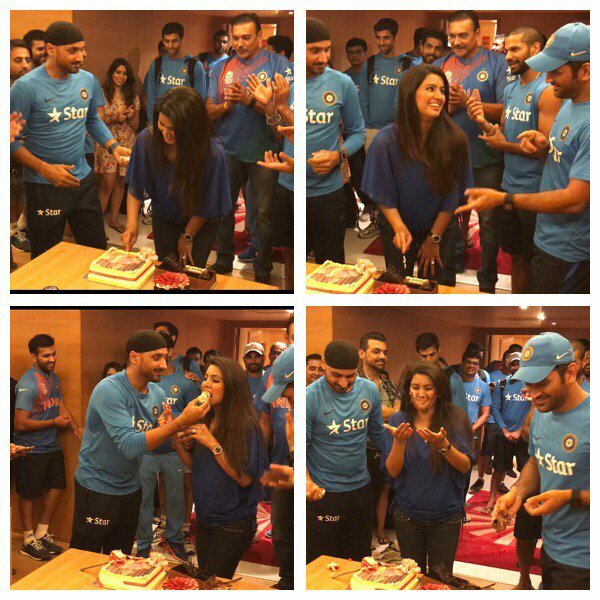 Harbhajan took to Twitter and shared a collage of cake-cutting moments with Geeta.